This year the fourth-annual fundraiser bicycle ride known as Nola to Angola will kick off on Friday, October 17th with more riders than ever before and a much loftier financial goal. 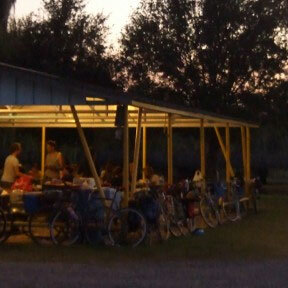 Each year in October, cyclists leave New Orleans and bike the 170 miles to arrive at Angola Prison three days later. They do this to raise money to support Cornerstone Builder’s Bus Project, and to highlight the distance separating people from their incarcerated loved ones. Reverend Leo Jackson, who founded the Bus Project in 2007, says “The more we can keep the family intact, the more we can affect positive change,” he says. “We want to keep lines of communication open between prisoners and their families.” For many people without access to reliable transportation, travel to visit an incarcerated relative is nearly impossible. These bus rides often represent the only opportunity for families to visit their loved ones. This is significant because for many incarcerated Louisianans, parole is an elusive dream – about 90 percent of the more than 5,000 people incarcerated in Angola will likely remain inside the prison for their whole lives. To date, Cornerstone has brought over 4,000 individuals to visit a family member who is imprisoned in Louisiana. Each 55-passenger bus trip costs about $1,000, and last year Nola to Angola raised a surprising $25,000, exceeding their goal by so much that Cornerstone was able to double the number of buses they sent in the past year. Each bus always has a waiting list of family members hoping they’ll be able to make the trip and spend too-short but precious time with their loved one. This year, more riders than ever before have expressed interest in joining the fundraiser. Riders pay their own expenses for food and support vehicles, so that all money raised goes directly to the Cornerstone Builder’s Bus Project. That Cornerstone was founded in New Orleans is no coincidence. Louisiana has the highest incarceration rate per capita in the entire world, and New Orleans leads the incarceration rate in the state. So many of the people living their lives behind bars throughout the state are from the New Orleans area. Just this May, in a widely-criticized return to Louisiana’s infamously strict heroin possession laws of the 70s, Governor Jindal signed a bill ramping up mandatory heroin sentencing from 50 years to 99. Heroin laws were modified to be more humane in the early 2000s after reform efforts that focused on drug use as a public health issue rather than a felony offense. A large percentage of those incarcerated at Angola, not to mention those sitting day after day in Orleans Parish Prison awaiting trial because they cannot afford to pay their bond, are non-violent drug offenders. Helping these people maintain connections to their families is not only the right thing to do, it also helps ease the transition out of prison for those lucky enough to be released. The ride will begin on Friday October 17th at 8am near OPP, outside of the New Orleans Municipal Court at 727 S. Broad, with a brief press conference featuring Councilman Jason Williams, Cornerstone’s founder Leo Jackson, and representatives from NOLA to Angola and from the Orleans Parish Prison Reform Coalition. To donate to the Cornerstone Builder’s Bus Project, or to learn more about the ride, please visit www.nolatoangola.org.